Here’s a fun , easy and healthy treat that you and the kids can make using some of your favorite apples to create a delicious batch of applesauce using a few ingredients and your crock-pot. To get started have the choose the apples they want to use and have them wash their hands along with their apples. Next give the kids bowls to keep track of their apples. Children from the ages 3-1/2 years of age and up can easily help make a batch of this applesauce for family meals or holiday events and parties. It’s not always necessary to peel the skins off the apples for applesauce but to make it easier for the younger kids mom or dad may want to add this extra step. Parents can also use an apple slicer to peel and core the apples to make it quicker for the young ones to start making the applesauce. After the apples are sliced up and put into a bowl you and the kids can get to work making your applesauce in a crock pot. 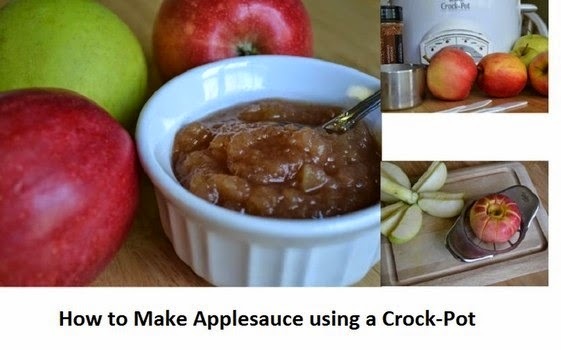 Easy Crock-Pot Applesauce. Download or print these instructions and have fun anytime of the year making some easy applesauce at home.